Kabuto Yakushi is Orochimaru's personal medic, assistant, and general right-hand man. 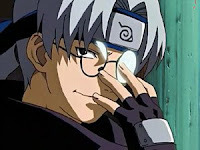 Kabuto was found as a young boy by a chief medical officer of the Konoha Medical Unit Squad. The officer brought Kabuto with him back to Konoha and raised him as a son. Kabuto eventually began acting as a spy for numerous countries and organizations (such as Akatsuki) before coming under the servitude of Orochimaru. Kabuto has since used his various former affiliations as a means to gather intelligence on Orochimaru's behalf, such as entering the Chunin Exams as a Konoha ninja to gather information on his fellow participants for Orochimaru's use. Despite his apparent loyalty to Orochimaru, Kabuto's true personality is difficult to discern; he frequently switches from a lighthearted and polite teenager to a twisted and sadistic maniac that enjoys playing mind games with his opponents. While he generally obeys Orochimaru's orders, he is not above healing Orochimaru's enemies or trying to strike up polite conversations with Naruto Uzumaki when they meet. Orochimaru himself seems to have a hard time determining Kabuto's thoughts, and has suggested that Kabuto secretly works against him. Kabuto is a talented ninja, being compared to Kakashi Hatake in ability on more than one occasion, as well as being shown capable of killing ANBU members with relative ease. The bulk of Kabuto's fighting ability lies in the medical jutsu taught to him by his adoptive father. These abilities have been further enhanced through his allegiance to Orochimaru, as he has been able to experiment on others to increase his medical knowledge. As a result, Kabuto is able to reactivate dead cells in a concentrated area and grow new ones. While he uses this ability in battle to immediately recover from attacks, it can also be used during his experiments to keep test subjects alive for much longer than is feasible. Kabuto can even temporarily reanimate a corpse for use as an ally or a decoy. During his battle with Tsunade, she remarks that his fighting and healing abilities surpass her own when she was his age. Despite his talents, Kabuto has always served others, a fate he is dissatisfied with. As such, after Orochimaru's defeat, Kabuto integrates his master's remains into his body as a means to become more powerful and to no longer be the mere tool of others. The remains have since begun trying to take over his body.